Road conditions in the maritime provinces of New Brunswick, Nova Scotia, Newfoundland, and Prince Edward Island are quite good. The main highways are well maintained and the road signs are easy to understand. Side roads and local highways can be bumpy because of the area’s harsh winter weather. Rain water sometimes puddles in the road. Slow down during heavy rain to avoid hydroplaning. If you are traveling in the summer months, expect to encounter lots of road construction. Canadian law permits walking and bicycling on the shoulders of highways, even the Trans-Canada Highway. Be sure to watch for bicyclists and pedestrians. If you obey the posted speed limits, you should have no trouble slowing down or stopping for people in the road. Particularly in Nova Scotia, side roads may be gravel or “chip” roads. Slow down on these roads and leave plenty of space between you and any vehicle you may be following so you do not end up with a cracked windshield. Local roads may also have drainage ditches on each side, with narrow shoulders. 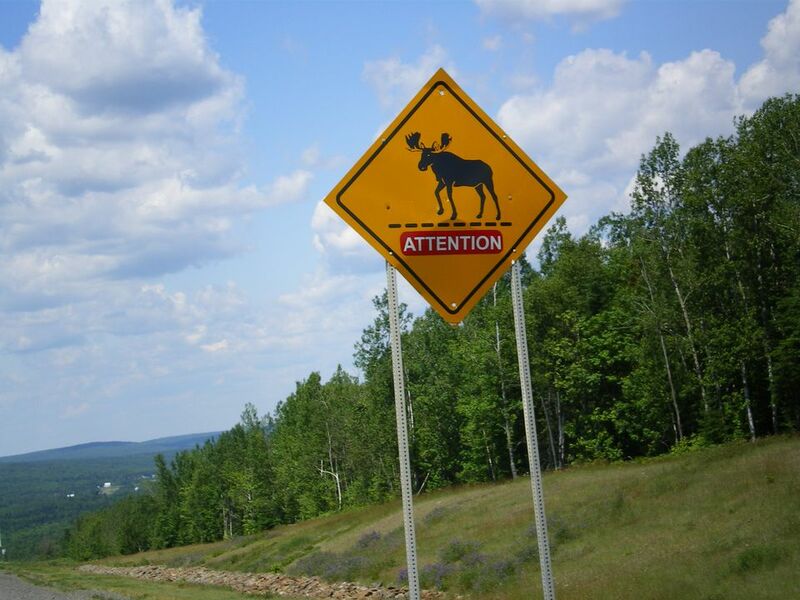 One of the biggest road hazards in Canada’s maritime provinces is the moose. These large mammals occasionally wander onto the road and pose a serious danger to motorists. Pay attention to warning signs, which you will easily recognize by the moose silhouette. Hitting a moose is no laughing matter. At best, you will escape with major damage to your car, but you definitely run the risk of being killed if you happen to hit a moose at high speed. Locals suggest that the best approach is to watch carefully for moose, particularly at dusk, at night and in foggy conditions, and stop if you see a moose standing on the road. Moose are not as agile as deer, so you may need to wait a few minutes for the road to clear. Tourist information offices are stocked with maps and brochures. Staff members are uniformly helpful and will make telephone calls or look over a map with you to make sure you have the information you need. Look for blue signs with a large white question mark to find tourist information offices. Most offices have well-maintained restrooms (called “washrooms”), too. Expect road construction during the spring, summer and early autumn months. Road construction projects can cause delays and detours; add extra time to your driving plan to compensate for these issues. You will easily find gas stations along major highways, but if you plan to wander the back roads, make sure you fill your tank before setting out. You will not find a gas station in every town, so it is best to be prepared. Gasoline prices are higher than in the US, but prices do not vary more than a few cents per liter within a given province. If you are driving to Canada from the US, fill your tank before you cross into Canada. Of course, if you plan to visit Canada during the winter months, you should prepare for snowy driving conditions. Be sure you have a working cell phone, emergency supplies (shovel, cat litter, candle, matches, and warm clothing) and snow tires or chains in addition to the road trip supplies you normally carry. If you drive in Canada, you must wear a seat belt. You can turn right on a red light anywhere in the maritime provinces. Canada’s drunk driving laws are extremely strict and the Royal Canadian Mounted Police enforce them rigorously. Carry all alcoholic beverages in the trunk of your car. Most importantly, never drink and drive.